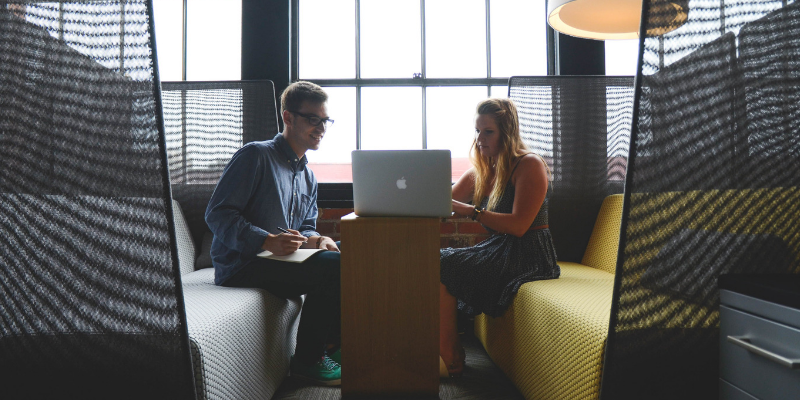 When a husband and wife write as a team, how do they create fiction that comes out seamlessly, sounding like one author? Big question. 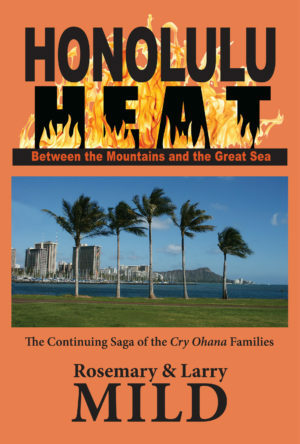 The couple’s newest work is their long-awaited sequel: Honolulu Heat: Between the Mountains and the Great Sea, the continuing saga of the Cry Ohana families. How did they start writing together? Early on, with hot-headed arguments and wounded feelings. Somehow they survived as they both improved their writing—and respect for each other’s. The toughest thing about writing as a team? Larry: “If you’ll excuse my Latin, there’s this co-writus interruptus thing. Working back-to-back in the same bedroom-turned-office. It’s too easy to stop her and ask: “Does adrenaline have an e? rather than look it up myself. As a team they face a potential snag working together. Rosemary: “I have my own nonfiction life—personal essays and memoirs. Love! Laugh! Panic! Life with My Mother is my newest. Miriam’s World—and Mine is my second memoir of our daughter Miriam Luby Wolfe, whom we lost in the terrorist bombing of Pan Am 103 over Lockerbie, Scotland. She was 20, my only child, and Larry’s stepdaughter. Larry published an op-ed piece in the Baltimore Sun, “Six Ways To Prevent Airline Terrorism.” Our Maryland congresswoman wrote it into the Congressional Record. 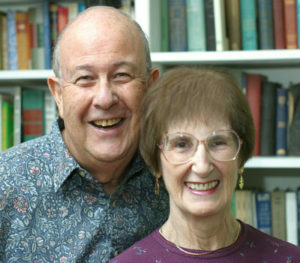 In the Milds’ second series, the Dan and Rivka Sherman Mysteries, they created a Jewish couple very much like themselves (but younger). Dan and Rivka buy the fictional Olde Victorian Bookstore in Annapolis, Maryland, and become reluctant sleuths. Larry: “Rivka is a lot like Rosemary: feisty, super-smart, affectionate, and addicted to chocolate. The Milds love using their own experiences in their fiction. In Hot Grudge Sunday, sleuths Paco and Molly are on their honeymoon out West. Their itinerary is based on a tour the Milds took, but with hair-raising consequences ending at the Grand Canyon. In Death Steals A Holy Book, the Menorat ha-maor (“Candlestick of Light”) is based on a rare Yiddish book that Larry inherited.